I do! My body is not perfect, but it is mine, and every day I make a conscious effort to take care of it and nourish it the best I can. Progress on my DDGbG goals: I handwrote a letter to my middle sister! She is finally figuring out her adult life - getting a decent job and sticking with it, and moving out of our parents' house - and I am so proud of her! This week's recipe was a super easy (and super delicious!) 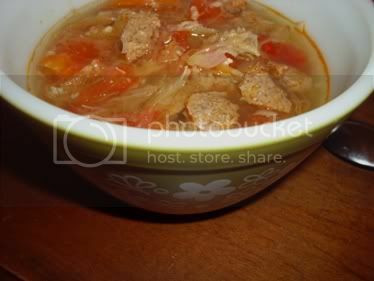 one from Lyn's blog: cabbage soup. I never thought cabbage soup would make me say oh-my-goodness. But oh my goodness, this cabbage soup? Epic. There isn't really a "recipe," per se - a cup of chicken broth (I used College Inn fat-free reduced sodium), a cup and a half of chopped cabbage, a half cup of chopped tomato, and about five ounces of cooked meat for protein - plus whatever spices you want. Put it in a pot, simmer for about 25 minutes, and voilà! Dinner for one. Because my container of chicken broth was a little bigger, I more or less tripled the recipe and froze some for the not-so-distant future. I was also in a rush, so instead of chopping my own cabbage, I used pre-cut coleslaw mix - just plain chopped cabbage and some carrot shreds. Amazing time saver! (Had to adjust cooking time accordingly.) For the tomatoes, you can use canned, but I used fresh (and I wish I had used maybe one more tomato - it was delightful). For the meat, I browned two and a half Butterball hot turkey sausages (about eight ounces - I tripled everything but the meat). And my spices? I used my garlic press and minced six or eight cloves of garlic into the pot (I lost count. I just love garlic!). No salt, because the "reduced sodium" broth is still pretty salty, I thought. And I would have added red pepper flakes if I hadn't used hot sausage, but the sausage gave it a mild and delicious heat. ONE thing that you are proud of for the week: Coming home from a hard day and craving a run instead of a pizza. HUGE victory for me! ONE thing that you can improve upon for the following week: Reading at least one book from my things-to-do-before-my-next-birthday list. Time is running out - I have ten books to read in sixty days! Totally do-able, I just need to focus.